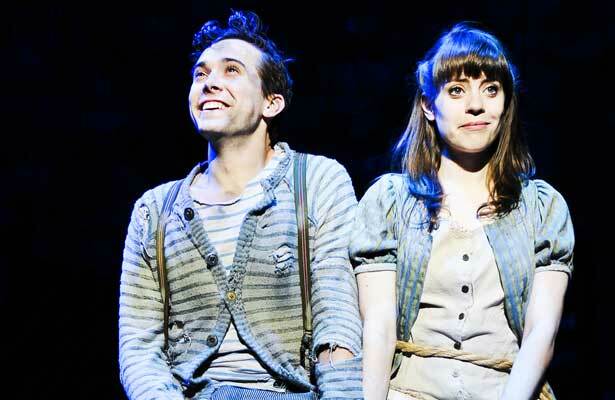 Peter and the Starcatcher is such a clever, whimsical, witty and enchanting play. I loved it when I saw the National Tour a few years ago at the Peabody, and now it’s being staged in a new production at the Rep, and I’ve been more than happy to revisit this marvelous show. The rep’s production, if anything, is even more cleverly staged than the tour, and with its charming cast and top-notch production values, it’s a real treat. The problem with telling the story of this play is that so much of the action depends on surprise, and how the story ultimately relates to the classic story of Peter Pan. I’ll just say that it involves a sea voyage on two different sailing vessels, as well as pirates, orphans, mermaids, a tropical island, and a mysterious substance known as “Star Stuff”. The central figures are young Molly Aster (Betsy Hogg) and an initially unnamed orphan Boy (Spencer Davis Milford), who meet on board the ship Neverland while Molly is on a mission to support her father, Lord Aster (Clinton Brandhagen), who is sailing to the same destination on a different ship in order to deliver a dangerous cargo. The story also features the grand villainy of the ambitious Black Stache (Jeffrey C. Hawkins), who along with his henchman Smee (Jose Restrepo) and their gang of pirates, aims to disrupt Asters’ mission and claim the supposed treasure for themselves. Much hilarity and adventure ensues in the process, with strong storytelling and inventive staging helping to advance the somewhat complicated but still entirely engaging plot. The technical qualities of this production are nothing short of superb. With a strikingly minimalist set designed by James Kronzer and consisting mostly of a ladder and a series of trapdoors, the story is brought to vibrant life. There’s excellent lighting by Kenton Yeager, and the costumes by David Kay Mickelson are marvelously versatile and meticulously detailed. The music is also put to good use, including a fun, fanciful number that begins Act 2 and has most of the cast dressed as mermaids. It’s a fast-moving, intricately staged production where timing is essential, and every move is executed with the utmost precision. The cast is a delight, across the board. Milford as the Boy and Hogg as Molly command the stage with their winning performances and strong chemistry. Hawkins is a comic treat as Black Stache, as well, providing many of the show’s comic highlights and supported with equal energy by Retrepo as Smee. 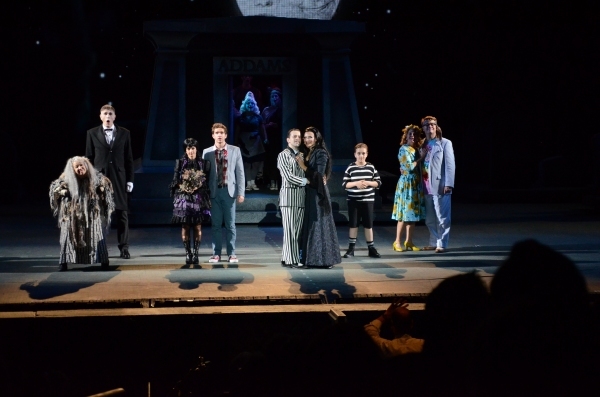 There are also standout performances by Andy Paterson as Molly’s nanny, Mrs. Bumbrake, Nick Vannoy as the smitten sailor Alf, and Andrew Carlyle and Sean Mellott as the Boy’s friends and fellow orphans, Ted and Prentiss. There’s so much energy, charm, and wit in this cast, and every player contributes to the sheer madcap joy of the production. It’s fun to see how all the elements of the story are introduced and then brought together at the end to form a cohesive prologue to the more familiar Peter Pan story, but to say to much would take away from the pure wonder of this show. Peter and the Starcatcher is, simply put, a marvelous show. The Rep’s production is a treat from start to finish, and an adventure well worth taking. 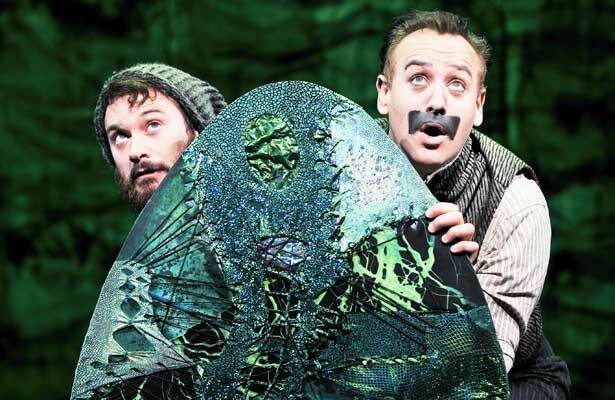 Peter and the Starcatcher is being presented by the Repertory Theatre of St. Louis until December 27, 2015. Peter and the Starcatcher is one crazy play, and that’s a wonderful thing. I had heard of this production before seeing it, and even did my research like a good little theatre critic, reading about the background and basic plot and style of the play. Still, none of that adequately prepared me for what I just saw at the Peabody Opera House. The national tour based on the original Broadway production of Rick Elice’s stage adaptation of this prequel to the classic Peter Pan story is a wild ride from start to finish, and I’m somewhat at a loss to describe it, but since that’s what I’m here to do, I will try my best. There are many surprises in this densely-plotted story, and it will be spoiling to say too much. The basic plot, however, revolves around a mission to deliver a trunk containing a mysterious treasure to the remote kingdom of Rundoon. Two identical trunks–one genuine and one a decoy–are brought aboard two separate ships and watched over by Lord Aster (Nathan Hosner) on the Wasp and his teenage daughter Molly (Megan Stern) on the Neverland. In the course of their journey, we are introduced to a wide variety of characters with agendas of their own, including the pirate and would-be great villain Black Stache (John Sanders) and his henchman Smee (Luke Smith), and a nameless orphan Boy (Joey deBettencourt) who, along with fellow orphans Prentiss (Carl Howell) and Ted (Edward Tournier), crosses paths with Molly and Black Stache and finds himself on an adventure he couldn’t have imagined. It’s a complex and involved plot that gets going very quickly and rarely slows down, revealing surprises at every turn and bringing out some genuine sympathy and emotion along with the broad comedy. There are many memorable scenes, including the Act Two opener that involves mermaids, some great jokes about theatrical conventions, some whimsical flights of fancy involving magic and flying, and a memorable conclusion that helps tie this story into the Peter Pan legend. This is one of the more inventive pieces of theatre I’ve seen, presented in a style that I can only call “spectacular minimalism”. The designs for the lighting (by Jeff Croiter), sound (by Darron L. West) and costumes (by Paloma Young) are excellent, and there’s also some wonderful music by Wayne Barker, but it’s all just enough to set the mood, as the troupe of actors presents the play in a bare-bones style that leaves a lot to the audience’s collective imagination. The first act takes places primarily on the decks of the two sailing ships, and the second act mostly takes place on a tropical island, although there is very little in the way of a set, except for a few pieces (a staircase, some netting, the two wooden trunks, etc.) to help suggest the scenes, and a lot of creatively used props like ropes that become doors, rubber gloves that are flapped to become birds, and so on. 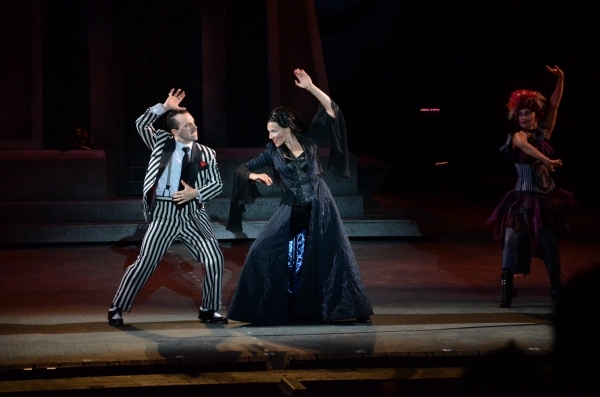 Much of the “set” is also suggested by the way the actors behave, such as when the ships rock back and forth and the suggestion of the movement is provided by a simple creaking sound effect and the movements of the cast. In fact, some of the production’s funniest moments arrive in the form of jokes about the inadequacy of the set and the fact that this is a play and we have to imagine that it’s real. The story is told in a broad, tightly directed and fast-paced style, and the actors deserve kudos for their remarkable precision and timing. I love the energy of this ensemble. Every member is completely in the moment, and the whole cast works together seamlessly to bring this story to vivid life. Chemistry is there in abundance, as well, with believable interactions between all the characters. In particular, Stern’s Molly and deBettencourt’s Boy present a convincing relationship, demonstrating a mixture of trepidation, challenge and obvious attraction as neither quite knows how to relate to the other at first. Sanders, as the hilariously foppish and braggadocious Black Stache, and Smith as his bumbling sidekick Smee also show excellent comic chemistry. Other great teams in this production include Howell as the ambitious Prentiss and Tournier as the food-obsessed Ted, and the hilarious combination of Benjamin Schrader (in men’s clothes except for an apron and hair bow) as Molly’s nanny Mrs. Bumbrake and Harter Clingman as Alf, a sailor who is smitten with her. Stern and Hosner are also given some great father-daughter moments. Much of the humor and sentiment of this production comes from the overall ensemble chemistry, and there isn’t a weak link in this cast. The individual performances are excellent, as well, with the standouts for me being deBettencourt as the curious and courageous Boy, Stern as the kind and determined Molly, and Sanders as the delightfully and ambitiously inept Black Stache, who gets the play’s longest laugh in the second act with a ridiculously long joke that’s better seen (and heard) than described. Based on what I had read, I expected to like this show, although I’m surprised at how much I enjoyed it and how bowled over I am at the sheer inventiveness of it, and the richness of the plot in addition to the laugh-a-minute hilarity. The story provides a suitably gripping background to the Peter Pan story without being too obvious, and it explores the themes of loyalty, family, and identity in a clear and compelling way. The only negative I can think of is that the run here in St. Louis is so short. There are only two days and four more performances left to see it, so I highly recommend catching this “star” before it moves on.